Want delicious, tender meatballs in a marinara sauce that tastes like it spent hours simmering on the stove? 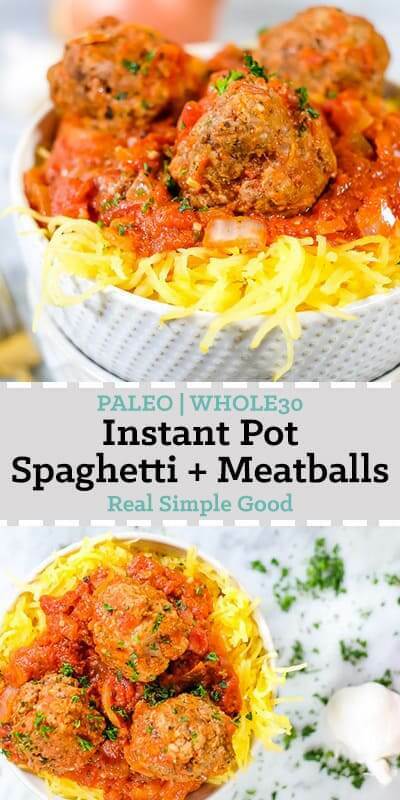 Welp, this Instant Pot spaghetti and meatballs not only takes only 45 minutes to make, but is also Paleo and Whole30 friendly. 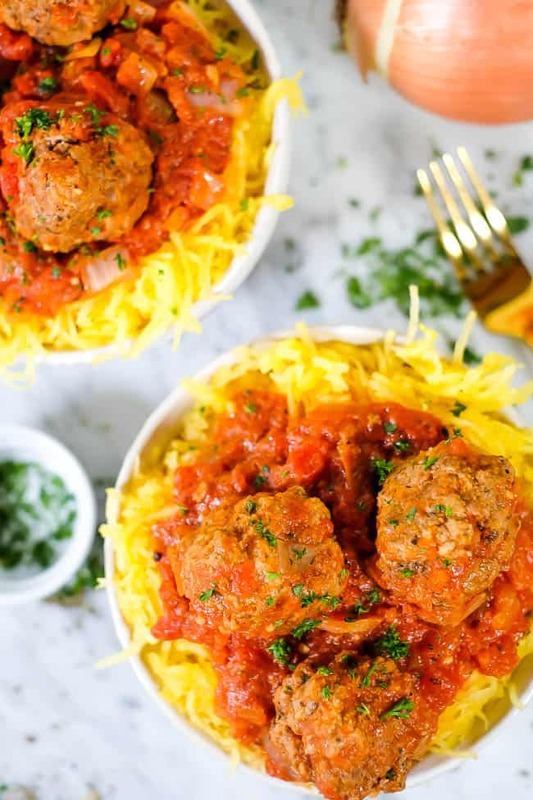 You’ll love the gluten-free and grain-free spaghetti squash noodles with the savory and delicious meatballs, slathered in extra sauce with no added sugar. 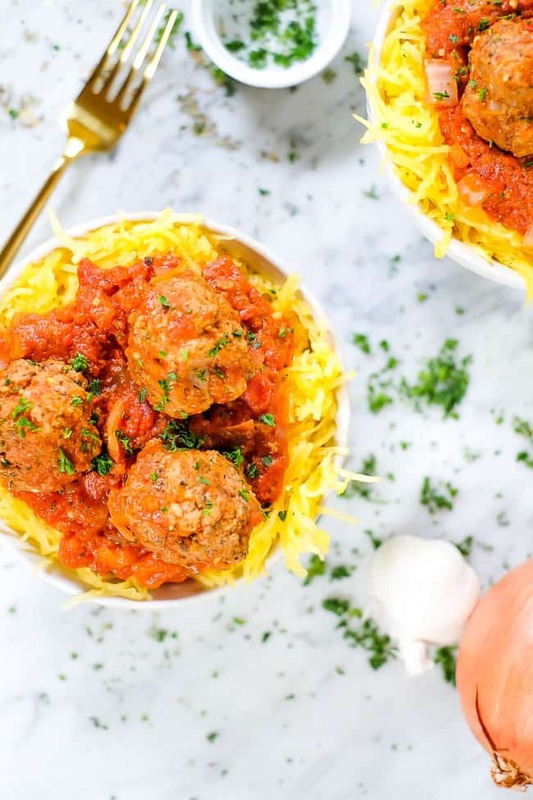 All in all, this healthified version of Instant Pot spaghetti and meatballs is an easy family favorite! We love using a combination of beef and pork for our meatballs. It gives them an extra little punch of flavor, and then we add some simple seasonings. We also add some almond flour to help bind and also to keep the meatballs tender once cooked in your Instant Pot. Mixing up your meatballs and getting them into your Instant Pot is the hardest part of this recipe, and it’s not even that hard, but maybe a little messy if you’re like me and just go for it with your hands to mix everything up. It’s worth it though! 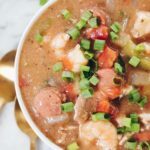 This recipe will give you leftovers to enjoy and you’ll feel like you’re eating total comfort food! If you’ve never used spaghetti squash before, you are in for a real treat! 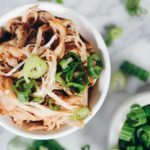 It is such a great way to get the texture of noodles without the grains, making it a lower carb, vegetable option! We like to cook ours in the oven so the squash and meatballs end up being ready at about the same time. 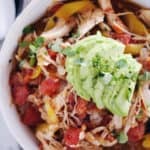 You can also cook your squash in your Instant Pot, and here are some instructions for doing that. You could make the squash in advance and store it in the fridge to just reheat it when you’re ready to serve your Instant Pot spaghetti and meatballs. You’ll save a little time and effort in the kitchen the night you enjoy this dinner if you do. 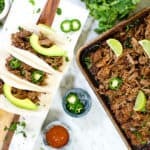 One of our favorite ways to meal prep without it feeling like extra work is to make a large meal for dinner Sunday night. Then, we have dinner that night and leftovers in the fridge going into the work week to reheat for lunch or dinner as needed on a busy day. It makes life easier, and we are all for that! 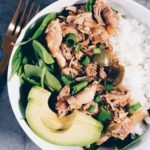 If you’re new to the concept of meal prepping, give it a try and see how it feels! 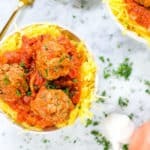 It’s so nice having the leftovers on stand-by in the fridge, and this Instant Pot spaghetti and meatballs is the perfect meal to make for these purposes. 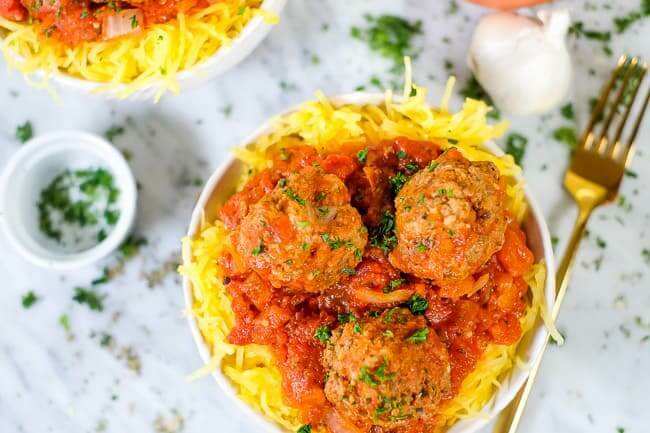 Sneak a little meal prep into your weekend and make this Instant Pot spaghetti and meatballs for dinner Sunday night. Then, enjoy the leftovers for lunch or another dinner. Let us know how it goes by leaving a comment below. Also, take a photo and tag us on Instagram @realsimplegood, so we can check it out! We love seeing your creations! Give us a follow Instagram if you don’t already, too! 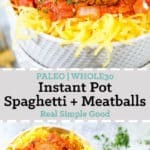 This Paleo and Whole30 Instant Pot spaghetti and meatballs is a healthified version of a traditional comfort food that is sure to be a family favorite! Heat your oven to 400° Fahrenheit. Cut the spaghetti squash in half lengthwise and scoop out the seeds with a spoon. Place the squash halves cut side down on a parchment lined baking sheet. Place in the oven to bake for 30 minutes, or until the squash has a little give when poked with a finger. NOTE: You can prepare your spaghetti squash in your Instant Pot using these instructions if desired. We just prefer to cook it in the oven so the squash and meatballs are ready at about the same time and we don't have to worry about keeping the squash warm. While she squash is cooking, add all of the meatball ingredients to a large bowl. Gently mix everything with your hands until the mixture is evenly distributed. Form the mixture into medium sized meatballs and place them in the instant pot. Chop onion and garlic and place over the meatballs. Pour the marinara and diced tomatoes over everything. Secure the lid of the Instant Pot and close the pressure valve. Press the “Manual” button or "Pressure Cook" and cook on high pressure for 7 minutes. Allow the pressure to naturally release for 15 minutes and then quick release any remaining pressure. When safe to do so, remove the lid and mix the meatballs and sauce around. Taste the sauce and season with any additional salt, pepper or herbs as desired. When the squash is cooked and safe to handle, shred it with a fork into "noodles". 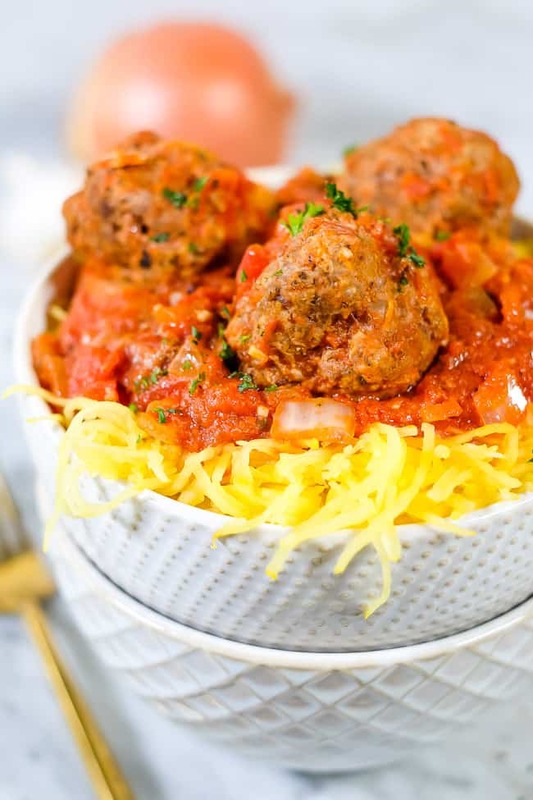 Serve the meatballs and sauce over a bed of spaghetti squash noodles. 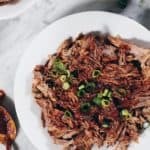 Can you do these in a slow cooker? We don’t have an instapot. We haven’t done it, but here’s what I’d try. Form the meatballs and place them on a parchment lined baking sheet. Broil for a few minutes on each side to brown them – about 3-4 minutes each side. Then, transfer to your crockpot and add the rest of the sauce ingredients and cook on low for 4 hours. Double check they’re cooked through and enjoy! Alternatively, you could also bake the meatballs, and then toss in a skillet with the sauce once done until the sauce heats up. Whatever is easiest for you! Can turkey be used instead of the pork and beef? My son is allergic to nuts and we are on a grainand gluten free diet so what can I use as an alternative? You could use turkey and omit the almond flour, but add an egg in with the turkey mixture as a binder.